Get ready for this beach, start today? 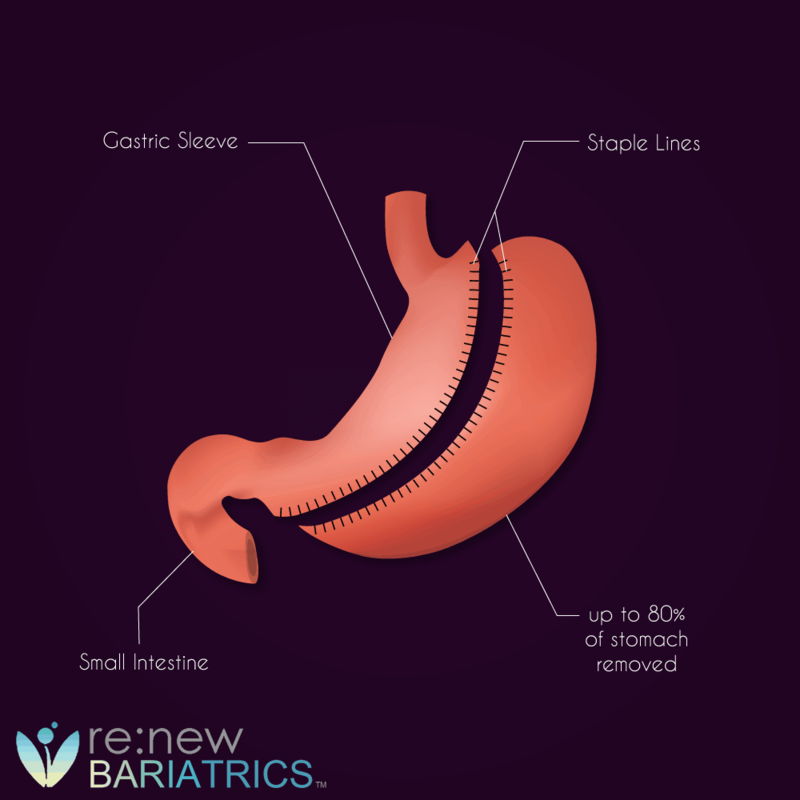 Renew Bariatrics is a premier provider of gastric sleeve surgery in Tijuana, Mexico. With our convenient location in Tijuana, Mexico, we can help you achieve weight loss success today. Our Mexico gastric sleeve packages are affordable and all-inclusive. No surprise fees, no gimmicks, just all-inclusive pricing. Gastric sleeve surgery is a safe option for significant and sustained weight loss with minimal risks. Gastric sleeve surgery, also known as vertical sleeve gastrectomy (VSG), has been performed in Mexico for well over ten years, amounting to unique surgeon experience. The gastric sleeve surgery has quickly become the leading choice for those suffering from obesity. Learn more about the procedure below. 8 Am I a Candidate For the Gastric Sleeve Surgery? 12 Gastric Sleeve: Stomach Stretching? 23.0.1 Still Deciding on Weight-Loss Surgery in Tijuana or Cancun? Tijuana – The leading medical tourism destination in Mexico, with many leading bariatric surgeons to choose from. Cancun – Discover a paradise destination while you rid yourself of your excess weight. When patients seek out medical tourism, they want to focus on recovery from surgery and not the stress of coordinating their travels. Here at Renew Bariatrics, we’ll organize all your logistics and travel arrangements, so you focus on recovering. Our dedicated bariatric staff has the experience and knowledge to craft a medical package that will meet your expectations. Contact us today to experience the Renew difference. When searching for the best gastric sleeve surgeon in Mexico, it’s tough to navigate through all the providers. There are a lot, and many doctors claim superior patient care and service, all while advertising a low price. Renew Bariatrics’ leadership has been in the industry of medical tourism in Mexico for over five years. We know what it takes for patients to decide on this life-changing surgery, swift through the providers to find the perfect surgeon, only to be disappointed with the process and outcomes. Our patient portal will help you take an active role in this entire process, contribute to ease your mind and facilitate the pre-operative process. We practice only evidence-based medicine, using techniques that have been shown to either reduce risks or increase outcomes. Our team has the experience you need to make sure you have a safe and fruitful trip. Gastric Sleeve Surgery, often called “sleeve surgery” is a bariatric surgery procedure whose primary function is to facilitate intake restriction by permanently reducing the volume of a patient’s stomach. Removing a major portion of the stomach leads to a significant reduction of ingastric volume, as well as reduction of the ghrelin hormone – which results in increased satiety and decreased appetite. This two-part mechanism will lead to greater patient outcomes than gastric banding. Gastric Sleeve is an excellent choice for most bariatric candidates because it provides high levels of expected weight-loss and low surgical risks, in particular, because it is performed laparoscopically and is a minimally invasive surgery (MIS). It also provides easy dietary recommendations post-surgery, something enviable for other bariatric surgeries. Overall, the gastric sleeve procedure is the ideal procedure for many patients. Gastric Sleeve Surgery works in two distinct ways, first is the reduction of the stomach’s capacity, also known as a restriction. This smaller stomach will make patients feel fuller faster after eating, signal your brain to stop eating. Secondly, the ghrelin production will be reduced, which causes hormones that cause hunger to diminish. This lower amount of desire will also contribute to lower caloric intake, and thus, weight loss. Gastric Sleeve surgery is performed laparoscopically, with 4 to 6 laparoscopic instruments inserted into the abdomen to allow the surgeon to maneuver. Then the trocar is placed in the abdomen, whose purpose is to cut the stomach and staple the stomach closed. The bougie is inserted endoscopically, to allow an outline for the surgeon to cut the stomach. The bougie size, which is often prominently advertised on many provider’s websites, just says how big the stomach will be after surgery. After the discarded stomach is removed (via through the laparoscopic holes), the surgeon performs a leak test to make sure the stomach is properly sealed off. The surgeon will then stitch up the 4 to 6 holes in the abdomen. You’ll then be ready to recover in our hospital. Our patient care coordinators will help you at every step of the way, promising to work with you closely during the weeks leading up to the surgery. Health Assessment: Important questions regarding your medical and surgical history. Also, including family history if relevant. Ascertain additional tests like an ECG, x-rays, or blood test – if appropriate. Many patients will ask, “Why do I have to undergo a diet before my gastric sleeve procedure?” It’s not an unreasonable question, but the pre-op diet has many functions, including shrinking the liver, establishing a routine, and psychological benefits. The pre-op diet is designed to ensure a safe surgical procedure. Also, the surgeon will have an easier time navigating your abdomen with a smaller liver. Patients not following the pre-op diet may have more surgical risks and have a harder time with post-surgery weight loss. Another reason for a pre-op diet is to establish a routine to ensure weight loss after surgery. Typically the surgeon will request between 2 weeks to 4 weeks pre-op diet – averaging around two weeks. Most patients will feel some sort of anxiety and nervousness the day of surgery, which is to be expected and normal. After your initial arrival in Tijuana, Mexico you’ll meet with our staff to get checked-in. This will consist of a blood test and height and weight check (BMI). This will ensure that you’re ready for the next day’s surgery. Surgery will take place early in the morning, so be sure to follow your surgeon’s list of food, drinks, and activities not allowed. You’ll be fasting from early that night so make sure not to drink, eat anything, smoke or chew tobacco the night before. It’s imperative to follow our rules for surgery as if you fail to comply you may be denied for surgery or worse. When you check into pre-op on the day of your procedure, our nurse and anesthesiologist will help ease your trepidations while removing any jewelry or watches you may be wearing. Then you’ll be asked to change into a hospital gown. You’ll then need to get to get into an IV, given medication to further help ease you. You’ll then be visited by our anesthesiologist who will contribute to sedate you for the operation. The circulating nurse will meet you and wheel you back to the operating room (OR), then ask you to breathe backward. Once you fall asleep, the surgery will take place – typically 1.5 hours which will depend on several factors. After you wake up, you’ll be wheeled into your hospital room where you can meet your companion(s) again (family and friends). You’ll stay this night and the following night in the hospital – where you’ll be routinely checked upon by the surgeon, nurse, and staff. You’ll be asked to walk around to help reduce the risk of blood clots and assist in ensuring proper healing. During the second day, you’ll do another gastric leak test to ensure no leakage. After the second night in the hospital, you’ll be released and driven back to the hotel to recover from the final night of your trip. You’ll stay that night in the hospital sticking to your postoperative diet. The next morning we’ll transport you back across the US/Mexico border for your journey back home. Although it’s not likely that an emergency will arise after gastric sleeve, here are some indications of serious problems that can arise after gastric sleeve surgery. Pain, especially, abdominal pain that increases over time. If you experience any of the following call your patient coordinator in Mexico immediately. They will help diagnose and get proper treatment. During your initial recovery, you won’t be able to eat or drink anything for 24 hours after surgery. Our surgeon will also get you up and walk around quickly to start the healing process. Full recovery from gastric sleeve surgery will typically happen within 2 to 4 weeks. Sometimes recovery can take as long as six weeks to full recovery. Am I a Candidate For the Gastric Sleeve Surgery? While traditional health insurers make their patients jump through many hopes to eligible for the gastric sleeve, Renew Bariatrics takes a more preemptive stance. We believe that obesity is a severe crisis in North America and Worldwide. We know that it takes serious gumption to undergo a surgery like this, so you shouldn’t have to be treated like you want the easy way out. We know that if you’re medical qualify and understand the risks and realistic expectations post-surgery you are an ideal candidate for the sleeve procedure. Family medical history with comorbidities including hypertension (high blood pressure), type 2 diabetes, high cholesterol, heart disease, heart attack due to obesity, and obstructive sleep apnea. Have tried and failed to lose weight on your own, through either traditional programs (weight watchers, Jenny Craig) or pharmacology? Please explain. A full understanding of the process you’re about to go through, and the realistic expectations are resulting. Although this is the minimum to be a successful candidate for weight loss surgery, there are medical contraindications that may prevent you from being a candidate. It’s important to contact our helpful staff today to learn more about our process. It’s a difficult question to answer as it will depend on several factors, heavily dependent on each patient. However, we’ve pulled some research studies below which will help to illustrate the potential weight loss success many patients achieve. Most patients will wonder what kind of weight loss they can expect. There are several research studies suggesting the excess weight loss (EWL) of gastric sleeve surgery. 3 Month: Average of 33% Excess Weight Loss. 6 Month: Average of 50% Excess Weight Loss. 12 Month: Average of 70% Excess Weight Loss. 18 Months: Average of 65-70% Excess Weight Loss. What is Excess Weight Loss? Excess weight loss (%EWL) is a common metric for reporting weight loss after bariatric surgery. The %EWL can vary depending on the definitions of ideal body weight (IBW) used and the preoperative weight. To find your excess weight loss, you need first to find your ideal body weight, which can vary from patient to patient. One 300 lb patient may want to achieve a 150 lb, while another may want to reach 130lb. Once you have your ideal body weight, you can calculate your expected weight loss. An example of a 300 lb Patient whose ideal body weight is 150lb. 3 Months: 49.5 lbs weight loss from the starting point. 6 Months: 75 lbs weight loss from the starting point. 12 Months: 105 lbs weight loss from the starting point. The ending patient weight after 12 months will, on average, be 195 lbs. With gastric sleeve surgery, most patients will see that the results they experience three months or 6 months out, is not temporary. In comparison to other bariatric procedures, the gastric sleeve has minimal risks. Most importantly, the death rate is 0.3% and is falling with improvements in surgical technique and surgeon experience. Outside of mortality, one of the most fearful risks including gastric leaks (explained below), bleeding, and stenosis/stricture. Overall, gastric sleeve represents a safe surgical approach to weight loss for most patients. Leaks are a common concern among gastric sleeve patients. They fear gastric leaks that may occur which are very serious. Renew Bariatrics practices evidence-based medicine, which is why to reduce the risk of leaks after gastric sleeve; we opt for the ideal bougie size to minimize gastric leaks. Another common question is whether the stomach can stretch. There is a lot of conflicting information whether the stomach can indeed stretch after gastric sleeve procedure. The stomach is made up of gastric folds or gastric rugae, which are folds that contract and expand with the food that you eat. Once the gastric rugae contract, well after you’ve eaten your meal, it helps pushes food into the intestines to digest. The gastric rugae will expand to allow for the extra volume (consisting of a full meal). This fold can be manipulated by being constantly being expanded. Therefore, there is no real way to prevent stomach stretching. However, you can help to delay the stretching. 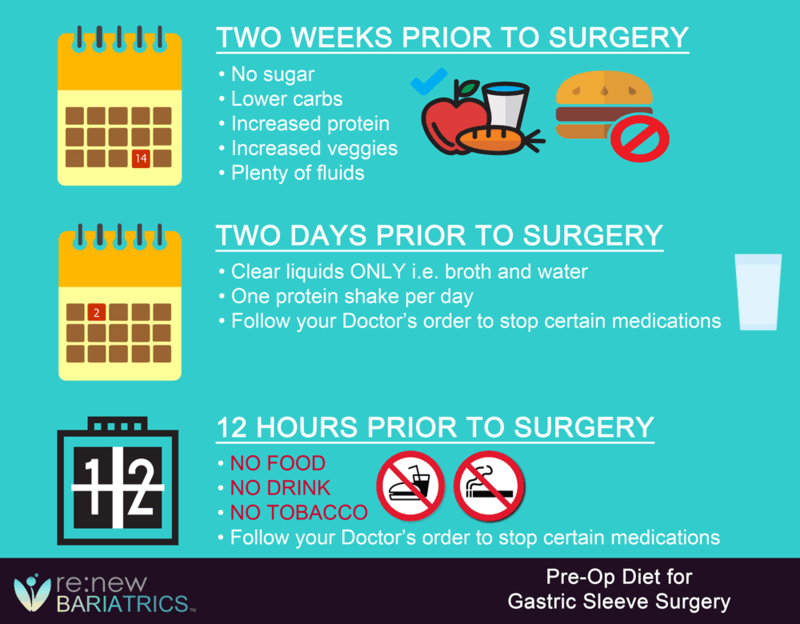 Will the Stomach Stretch after Gastric Sleeve Procedure? The answer to the question is that the stomach can, and will probably stretch after the gastric sleeve procedure. Most patients after the gastric sleeve procedure will remember how difficult it was to eat even a small portion of food, but after the procedure, they will be able to eat more. Not as much as they were before the gastric sleeve, but more than initial after the gastric sleeve procedure. To help reduce stomach stretching here are several tips on how to prevent stomach stretching. It involves, not overeating. Plan your meals thoroughly – ensuring you don’t overeat. Don’t drink fluids while eating. Do not drink carbonated beverages, as they help to expand your stomach. Eat small meals between your main meals. The trick to remember after the gastric sleeve is that your stomach is considerably lower than before. It’s imperative to make sure you’re eating the proper amount of foods, as well as eating the right foods, to make sure you’re not going to contribute to your stomach expanding. Today, most bariatric surgeons will recommend gastric sleeve surgery over most other bariatric surgeries. It’s a relatively simple procedure but has superior results for over 90% of all patients. Gastric Sleeve is performed by removing up to 80% of the stomach. By eliminating the stomach’s capacity patients will feel fuller faster, thereby limiting the patient’s caloric intake, while still being satiated. The gastric sleeve has another direct benefit, which is the reduction of the hormone ghrelin, which plays a role in hunger. Specifically, individuals on an empty stomach will secrete the hormone ghrelin into the bloodstream causing hunger feelings. Once you eat, the secretion will diminish, then will rise sometime again after. Studies have pointed out that removal of the stomach will lead to a drop in the production and secretion of ghrelin – which will cause patients to feel less hungry. 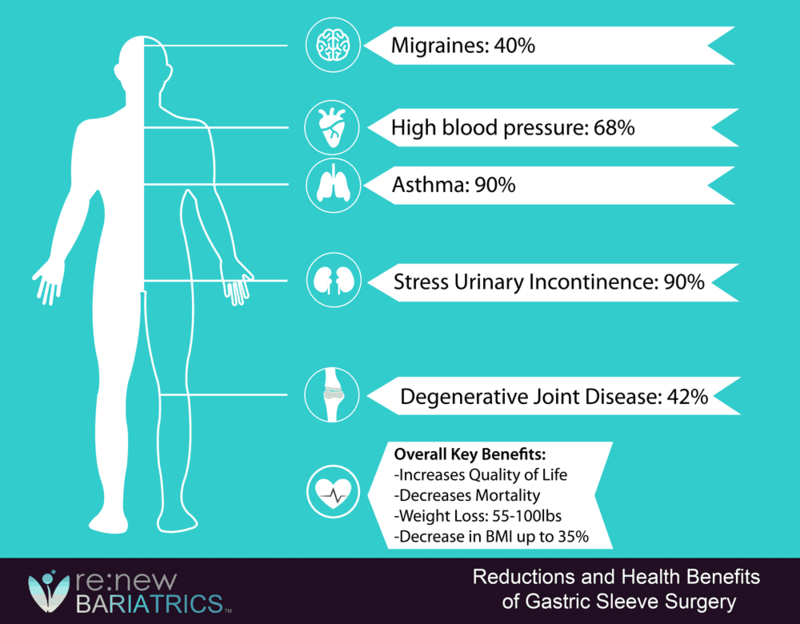 Over 93% of patients of the gastric sleeve has the quality of life improvements. Below we divided the health benefits from the non-health benefits. Gastric sleeve surgery is covered by many health insurance providers, but if you lack health insurance or your deductible is too high, what are your options? One option is to self-pay for the gastric sleeve, where you pay via money saved up or finance the surgery. This option can still be costly, especially if you’re seeking the United States or Canada. The cost of the gastric sleeve surgery can exceed $20,000, but in with medical tourism in Mexico, our prices are significantly less. Contact us today or view our page on gastric sleeve costs to learn about our updated prices. A second option is to acquire health insurance for the sole purpose of being covered for the gastric sleeve procedure. This has been done before in the past, but it can prove more difficult, more time-consuming and far more expensive than you previously realized. One blindside from this option is the six months of supervised doctor diet, where if you fail to realize any significant weight loss you can move on the other stage of being qualified for gastric sleeve surgery. Another possible issue could be the deductible for the surgery itself. Some deductibles for the gastric sleeve procedure are as high as USD 7,500. Body Mass Index (BMI) of at 40 or a Body Mass Index (BMI) of 35 with one or more of the following co-morbidities (more being better) Hypertension, Type 2 Diabetes, Heart Disease, Obstructive Sleep Apnea, High Cholesterol, or other health-related issues. Must have a six-month medically-supervised diet program. Must have a private consultation with a bariatric surgeon. Must get a medical clearance from your primary care physician (PCP). Must seek out a psychological consultation and get clearance. Must schedule nutritional evaluations with a registered dietician (RD). If you are considering acquiring health insurance for the sole purpose of being covered for the gastric sleeve procedure, please make sure you do all your homework before embarking on this journey. The easiest option to undergo the gastric sleeve without insurance is to self-pay for the procedure itself. This is where Renew Bariatrics is a formidable choice for patients, as our price is drastically below anywhere in the United States or Canada. Most self-pay patients are concerned with the costs of the procedure. 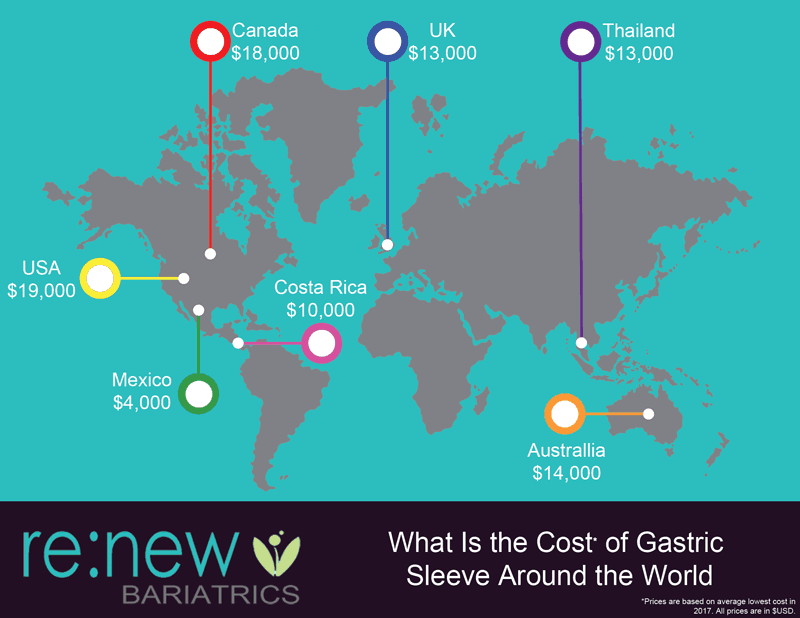 While the expense of the gastric sleeve in the United States, Canada can reach upwards of $20,000, Renew Bariatrics offers gastric sleeve at significant savings. Additionally, Mexico bariatric surgeons have been performing the sleeve procedure for quite some time, making Mexico’s bariatric surgeons highly-trained and experienced. If you’d like to know more about our qualifications and experience, please contact our helpful staff today. Our staff will help highlight the current promotional, all-inclusive packages for gastric sleeve. Choosing the best provider for the gastric sleeve is easy if you check out our weight loss surgery testimonials. With any major surgical procedure, there will be moderate side effects that all patients should be aware of. Specifically, the major side effects are Gastroesophageal reflux disease (GERD) developing after gastric sleeve. Vitamin-mineral deficiency may be possible but is easily offset by bariatric vitamins. Food intolerance may result in nausea or vomiting. Cosmetically, sagging as a result of rapid weight loss may occur – which can warrant post-bariatric body contouring surgery to remove. Other issues that may arise is weight regain if the patient doesn’t follow our post-gastric sleeve guide. The gastric sleeve has been growing in popularity ever since the United Healthcare added to their covered list of surgeries in 2010. Since that time nearly all other insurance providers have opted to cover the procedure. Renew Bariatrics is a highly accessible option for patients seeking gastric sleeve in Mexico. Our patient care coordinators will help you navigate your surgery in as few as a few weeks (if you’re seeking a quicker timeframe, please contact our staff today). Our staff has experience in getting the necessary information to make your approval as quickly as possible. Financially, we can help secure financing for your surgery and offer a multitude of payment options. All around, Renew Bariatrics is a leading provider of VSG Mexico. Contact our helpful and knowledgeable staff about our current gastric sleeve Tijuana and Cancun packages. 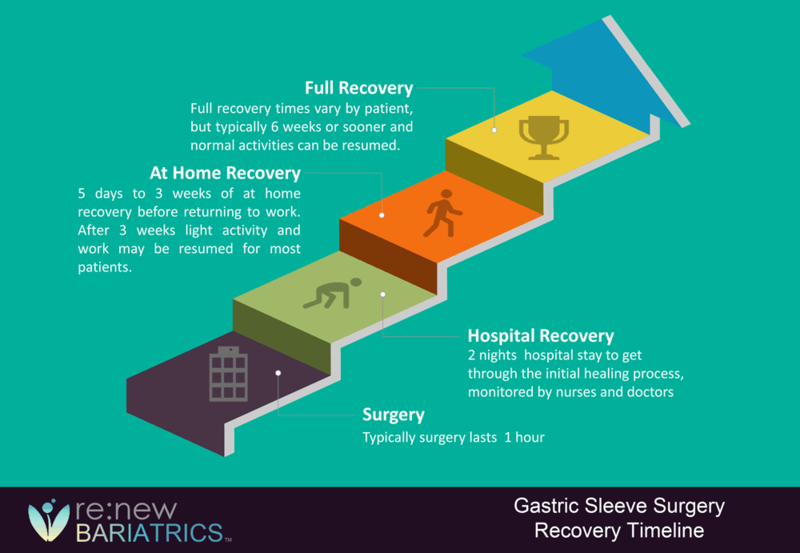 Gastric Sleeve recovery typically happens in six weeks, but most should plan to be off work for at least two weeks. Some may feel recovered in a little as one week. But it’s important not to overdo it physically as that can lead to serious problems without being fully recovered. Following gastric sleeve surgery, you’ll be required to consume vitamins to help offset any malnourishment. This is not unique to gastric sleeve, but as well as gastric bypass, gastric banding (lap-band), duodenal switch, and other procedures. Daily Multivitamin – which should be formulated for bariatric patients. Calcium Citrate – which should be taken in doses of 500mg three times a day. Daily Sublingual B12 – which should be taken sublingually (under the tongue). Iron – take on an empty stomach and should not be made with calcium citrate. All bariatric patients will need to consume between 60 and 90 grams of protein on a daily basis. Daily supplementation should be taken throughout the day to help satiate your hunger and feed your body. Women should aim for 60 grams of protein per day. Men should aim for 90 grams of protein per day. Having more self-confidence and being more assertive. Strangers being nicer to you and showing more respect. Research has shown that thinner people experience more beautiful strangers and more respect (read more, obesity discrimination). Not being fatigued or tired all the time. Having more energy to keep up with those around you. Experiencing more intimacy with partners. Experiencing romantic interest from others. After gastric sleeve surgery, there will be some changes in your life from the people in your life. If you’ve read some reviews on the internet enough, you’ll eventually know there can be issues with your relationships after bariatric surgery. One of the biggest problems is that many close friends and family may have trouble acting around you. Seeing the changes your body goes through may cause uncertainty with how to act around you. These issues can manifest in many different forms of jealousy, envy, insecurity, anger and other ways. When you start to lose weight people around you may not know how to act, including your overweight friends. They may not like the fact that you’re losing weight and they’re not. People may not like that fact that you’re more healthy, making better choices and becoming more active. Your partner may not like the fact that you’re losing weight, getting more confidence, getting more romantic and sexual interest. Many patients will feel the need to improve, not only their health, but other areas of lives, including excessive drinking, smoking, and other behaviors. Many around you may not like this change, as it hurts the way you and they relate and interact. Many patients want to progress in their development towards a more healthy lifestyle, and they might not want to associate with individuals who do not share the same mentality. Friends, family, and co-workers may look at Mexico bariatric surgery with disdain, affecting your relationships. It may also affect the way your friends and family perceive you. Anecdotally, we’ve seen some individuals personalities change after bariatric surgery. Most will say that their character is more straightforward, addressing the needs and wants. Most will say that this is a good trait to have. One thing to note after significant weight loss is that your hormones may change and swing. Specifically, estrogen and testosterone may change with the different changes in weight loss. Immediately after gastric sleeve, you’ll be put on the postoperative gastric sleeve diet which will help you lose significant weight. It’s important to follow this diet perpetually, but especially the first few months after gastric sleeve surgery. Unlike other bariatric surgeries, the gastric sleeve does not require regular lap-band fills to facilitate weight loss. Exercise is important after gastric sleeve as it’s essential to your long-term weight loss success by establishing new routines. Exercise is not only important to ensure proper mental and physical benefits, but also psychology – as more research is suggesting a link between the mind and body. Although both RYGB and exercise are effective in improving body composition and reducing comorbidities such as insulin resistance, in obese individuals. You should aim to work out at least three separate times per week, ideal 4 or 5. Spreading physical activity out will help with recovery and preventing burnout. Also, consider varying different experiences to keep them new, exciting and fun. Walking, Biking, Swimming: These are all great physical activities that should be incorporating, especially swimming. Running: You should consult with your physician whether you’re physically fit enough to jog or run. Strength Training: Lifting weights is a great activity that will also help firm your body as you begin to drop weight. (Wait at least two months before any moderate weight lifting routine). In Mexico, there are similar associations to help reveal a surgeon committed to excellence and continuing education in laparoscopic, bariatrics & metabolic surgery. There is the IFSO (International Federation for the Surgery of Obesity and Metabolic Disorders), which is a worldwide organization giving members the ability to keep abreast of all the latest advancements in bariatrics. Another leading certification to seek out is the Mexican College of Obesity Surgery, which certifies bariatric surgeons in Mexico. The Mexican Council on General Surgery is a widely popular affiliation many gastric sleeve surgeons in Mexico have. Lastly, another option is to seek out Center For Excellence, which is distributed by a for-profit company. Still Deciding on Weight-Loss Surgery in Tijuana or Cancun? Is Gastric Sleeve or VSG in Mexico Right For Me? Does the Choice of Gastric Sleeve Surgeon Impact Outcomes? Is Gastric Sleeve Surgery Safe – Safe in Mexico?